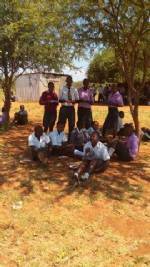 Mitamisyi Secondary School is a small school located near the border of the Kora /Mwingi conservation area. It opened its gates in 2011 through the initiative of the local community with a population of eleven students.At the outset it was a day school. The community made contributions through a Harambee arrangement and bought 12 acres of land on which the school stands today. The Constituency Development Fund then put up 4 classrooms and, more recently, a science lab.In 2015 there are 112 students on roll - 59 boys and 53 girls. There are two government teachers and another six employed by the Board of Management ie the parents. This is a heavy burden on very poor families. The population in the area is very sparse and the school is a considerable distance from the students' homes so they have many miles to walk each day. This places them in danger from wild animals and exposes the girls to the risk of attack. Water is a severe problem too. 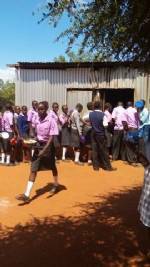 The school relies on boreholes which supply a wide area and which are unreliable. The water must be collected by donkey. This is a real community school which local families have struggled to establish and maintain. There is a great deal that can be done to help them improve the life chances of their children.